It’s said that an autonomous warehouse functions much like the way autonomous vehicles navigate the road. Robots move on their own throughout a warehouse, maneuvering around obstacles—they stop for human workers, pick up crates, and move them from one location to the next, moving through a packing system that may see very few human hands. Amazon is on the forefront of automation in the warehouse, currently using 45,000 Kiva Robots, after purchasing the company Kiva Systems in 2012 (they’re now renamed “Amazon robots”). These robots fulfill the picking and packing at Amazon warehouses, continuing to refine Amazon’s process. Standing at 16 inches, weighing a little over 300 pounds, and running at 5 mph, Amazon robots are capable of lifting up to 700 pounds—and also capable of lifting entire stacks of shelves. 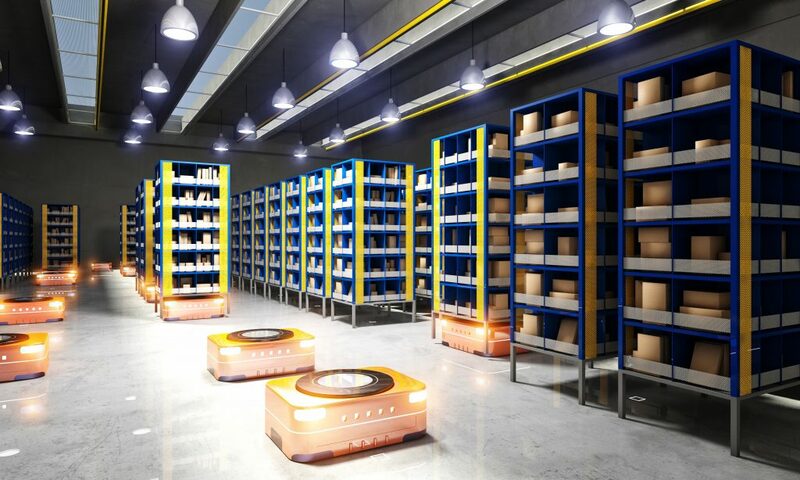 Since these robots are internal to Amazon, there have been many competitors who have stepped into the robotics playing field, as warehouse demands grow and change. There are many exciting new features of the autonomous warehouse. Real time inventory: Lost inventory can become extremely expensive. Screens can show exactly where each crate is at each moment, and where they are located as they are navigated through the system. For every crate, the journey from shelf to shipping is adjusted and configured through an algorithm. Depending on the order of items, the system might be adjusted accordingly—a heavier item might not be stacked on a lighter one, and so on. Systems Integration: In an autonomous warehouse, systems integration will pull the whole structure together. The robots are typically connected to a Robotic Management System (RMS) that integrates data regarding product—what’s high in demand, what needs to be picked and shipped quickly. The RMS will also help make sure that robots aren’t going to the same location, are completing tasks individually, and not getting into each other’s way—in some cases, to make sure that robots aren’t running into each other. Metrics: Autonomous vehicles have sensors to automatically gather data, which can be uploaded to various applications, hosted onsite or in the cloud. There are various apps that can be used to track metrics, from data that includes pick up size, the time needed for delivery, where the delivery vehicle is, how long it’s been in the facility, and so on. This allows customers to determine whether factors in the warehouse climate need to be changed, as well as figure out if there are any issues with vehicles, automated or otherwise. This also contributes to more predictability in the warehouse—it becomes much easier to tell what is being moved, when, and where. Driver Scanning: Driver scanning software can be fluidly integrated with your warehouse system—already, truckers can easily scan and send documents and integrate with logistics systems and apps. Documents can be routed to multiple departments, integrated with dispatch, billing, TMS, and other document management systems. These documents can automatically be routed to different people; delivery receipts can correspond with metrics from data showing information about the delivery process, and so on. Lighting and Security: It’s important that autonomous vehicles are safe and fully integrated with human coworkers. Laser sensors can distinguish employees from autonomous vehicles, to prevent collisions. Autonomous vehicles might also emit a horn automatically. In other cases, guide wires might lay out a definite path for vehicles, rather than free roaming. But with the correct safety precautions in place, free roaming vehicles should not present a danger. Vehicles are typically programmed to reduce speed around corners, and can detect when objects or humans are in its way—then it will stop. Lighting can also be automated for human workers, as the robots don’t need light to operate. Automated Gate System: When gates can be controlled automatically through an automated gate system, throughput is increased at access points. An automated gate system will typically include the ability to centrally control gates from other facilities, calling for less management to monitor gate functions, and cutting down on staff crowding at exit and entrance points. This would also increase visibility, and improve the capacity to predict and plan for driver traffic and patterns. Business Continuity: Strategies to prevent accidents in automated warehouses include robotic functions that reduce the risk of physical strain in human workers—and automated routes that decrease the chance for warehouse collisions. Robotized movements are also believed to improve warehouse safety and reduce the risk of work-related physical problems. Automating these processes only increases productivity and output. Mobile System: A mobile robot system means that robots can handle an operational system without the need for physical or electromechanical direction. Mobile shelves in a warehouse also mean that product is always accurately located. Employee tracking: It’s now possible to gauge the moments when employees are genuinely productive. While that might raise concern about privacy, it’s an efficient approach that can accurately detect what’s working at a company and what’s not. Automated systems can track employee time and location, automatically track the amount of time worked, and allow for more efficient accountability. As the warehouse environment grows and evolves, humans and robots work alongside each other to efficiently navigate the new automated landscape. As tools and techniques are developed, it’s important to stay well-informed about the continually changing scenery of automation. Evans is proud to be part of the supply chain of companies moving into a robotic environment, and looks forward to seeing the developments in automation in the years to come. Easter 2015: Is Your Supply Chain Ready?